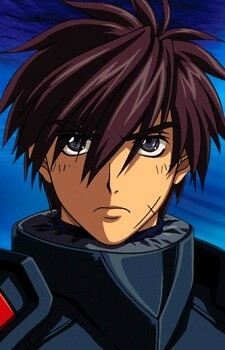 Sousuke is the main protagonist of the series. He is of Afghan Japanese heritage. While he is inherently Japanese due to his name, Sagara grew up in Helmajistan, a region in Afghanistan that was caught up in political strife. At age 8, he joined a guerrilla movement to survive, and was eventually recruited by Mithril. Sousuke only knows military life and as a result he does not handle the everyday occurrences of civilian life very well. He also has a tough time integrating into high school life as his social skills are not quite up to par. His military bearing and encyclopedic knowledge of weapons earns him the nickname 'Military Maniac'. The basic problem this causes is, for instance, how he blows up the shoes lockers if there is any clue that someone has tampered with them. Sousuke can be quite insensitive at times, for example in volume 7 he bought a pregnancy test while out with Kaname and did not understand what was wrong, though his intentions are always in the right place. His deep feelings for Chidori Kaname are unavoidably clear by the beginning of TSR when he punches his fist through a laptop with the message of his direct order to not contact her anymore. Sousuke eventually decides to give up his life as a soldier and retires from Mithril, deciding that he wanted to be with Chidori instead. Upon his return, Sousuke confirms his feelings for Chidori and the two share a kiss in the school court yard.